In what follows, I suggest, slightly controversially perhaps, that it is time to move on from the ‘responsibility to protect’ (R2P) controversy, which has bogged down much of the thinking on humanitarianism and responses to conscience-shocking human rights violations among practitioners, policy-makers and especially the scholarly world for too long. R2P was a helpful vehicle for shifting the focus of the debate from ‘humanitarian intervention’ (the prefix ‘humanitarian’ possibly deserving an extra set of inverted commas) – a term with both conceptual and political baggage – to responsible protection. However, the new discourse, while an improvement on the former, premised on a discretionary right of (unilateral, unauthorised) intervention, brought with it a host of new challenges – explored in the current issue of CRIA – that undermine both the analytical usefulness, as well as the political expediency, of R2P. While the emergence of the responsibility discourse has helped transcend a range of problems, I suggest that the principle has now served its purpose, both academically as well as politically, and it is now time to move the debate in a new direction. But before looking ahead, it helps to look back. The R2P principle is the product of a long lineage of humanitarian ideas. Its direct precursor is ‘humanitarian intervention’, but the concept complements, influences and has been influenced, by other related concepts including the ‘protection of civilians’ and ‘human security’. These terms remain in use but are distinct from R2P. Substance is important, but so is provenance – who has owned these concepts throughout history is just as politically salient as their purported meaning. More recently, ‘human protection’ has emerged on the scene, being referred to in recent publications. The ‘protection of civilians’, a term associated with UN peacekeeping resolutions, continues to be in use in resolutions and formal documents. The term is technical in nature and does not allude to wider principles or attribute responsibilities as part of a coherent framework as is the case with R2P. The technocratic nature of the term meant that it was less controversial, but also meant that it could not serve as a vehicle for broader norm advocacy. Today, it is almost impossible to justify intervention exclusively on the grounds of self-defence. ‘Human security’ was first mentioned in Boutros Boutros-Ghali’s Agenda for Peace and gained traction with the publication of the 1994 Human Development Report. Its advantage was that it focused the debate on individuals as referent objects, broadening the range of issues perceived to threaten individuals and the communities upon which their livelihoods depend. The emergence of ‘human security’ constituted a conceptual turn that developing states and critical scholars particularly welcomed. However, the term has been criticised for its ambiguity and lack of concrete utility for practitioners, owing to the wide range of determinants of human security. ‘Humanitarian intervention’ became a salient term – both analytically and politically – throughout the 1990s, with the heightened influence of constructivist scholarship on norms, and the increasing use of humanitarian justifications for military intervention, notably in Kosovo. Nicholas Wheeler’s seminal book, Saving Strangers, captures the normative shift that has facilitated the use of humanitarian justifications for the use of force, in addition to, or as a substitute to, justifications based on self-defence and national security. Since then, the discourse has shifted to such an extent that it is today almost impossible to justify intervention exclusively on the grounds of self-defence, as the Iraq War has shown. However, while the term – like ‘human security’ – has been immensely useful in advancing the debate, it may now be beginning to outlive its purpose. The emergence of an alternative discourse, as well as the lack of popularity of the term among developing states has contributed to this shift. Nevertheless, recent scholarship continues to make frequent reference to ‘humanitarian intervention’. R2P has a range of advantages over the aforementioned terms but falls short in other ways. It is more focused than ‘human security’ and less apolitical than the ‘protection of civilians’. It is narrower in its objectives than ‘humanitarian intervention’ and wider in terms of the range of measures at actors’ disposal in realising these objectives. At the same time, it is more controversial than all of them. 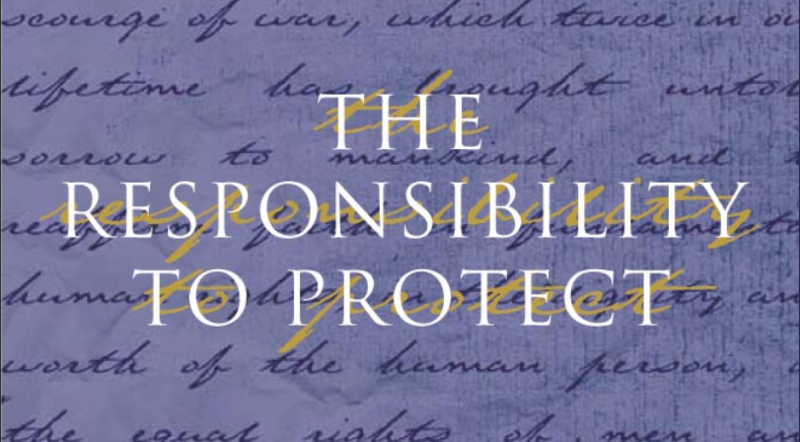 ‘Human protection’, in contrast, has all of the advantages of ‘human security’ (the individual is the key referent object) and the ‘protection of civilians’ (it is apolitical), but also retains the advantage of R2P in that it alludes to a protection responsibility. Moreover, as opposed to the ‘protection of civilians’ it can be applied to populations, including combatants, rather than just civilians. At the same time, it is more specific than ‘humanitarian intervention’, but broader in its scope than R2P, which, according to the World Summit Outcome Document consensus, is focused on four sets of crimes only – genocide, ethnic cleansing, war crimes and crimes against humanity – thereby excluding a host of other grave human rights violations. The term therefore has a range of advantages and few, if any, disadvantages, and at the same time, is less controversial than both ‘humanitarian intervention’ and R2P. This is not to say, however, that R2P has not served an important purpose. It brought the object of protection – the individual, rather than the state – to the fore. It narrowed the scope of the protection focus, which helped defuse the critique of ‘humanitarian intervention’. It broadened the range of measures that could be employed to achieve humanitarian objectives, highlighting the role of non-military and non-coercive measures at the disposal of international actors. It has been valuable in that it has allowed the epistemic community to negotiate key theoretical and normative premises, as well as a host of issues pertaining to agency and implementation. In that sense, it is has served as a useful platform to advance the debate. Still, the discourse on the R2P has now arguably reached a point of saturation and, if the debate does not move forward, stagnation may ensue. R2P has served its purpose conceptually as well as in terms of norm advocacy – what we are now left with are the distilled derivates of the discursive process. However, ‘consensus’ still eludes the ‘responsibility to protect’, and the critique that remains is likely to persist. For these reasons, the continued value added by the concept is questionable; perhaps it is time to move on. Noele Crossley's article, Is R2P Still Controversial? Continuity and Change in the Debate on Humanitarian Intervention is available in Volume 31, Issue 5 of the Cambridge Review of International Affairs. Noele Crossley is Departmental Lecturer in the Department of International Development, University of Oxford, and a Teaching Fellow in International Organisations and International Security at University College London. Her research interests are in the areas of security studies and peace and conflict studies, revolving, in particular, around constructivism, norms and international society, and human protection.